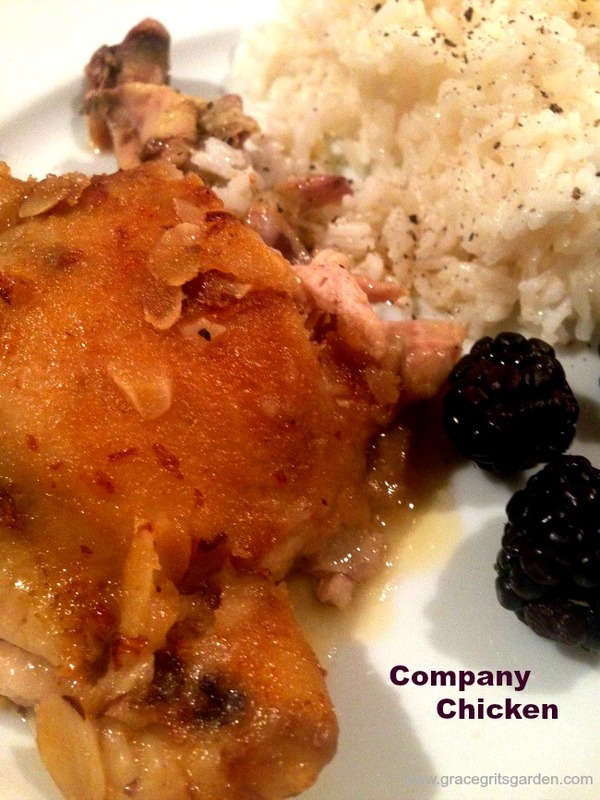 Hey, hey it’s been a while since I made a recipe from Keiser’s Kitchen vintage cookbook, but today I present Company Chicken (originally submitted by C.W. Bell). Since I have company staying for a week in my guest quarters, how could any other recipe be more perfect? Unless it was called Tom Sweeney Chicken because Tom Sweeney is the writer-friend holed up writing in our guest quarters. The chicken was falling off the bone tender and flavorful. My company liked it and if he didn’t, I have no doubt he’d let me know. He’s from the Northeast. Here’s the recipe. So easy! Check out the purple mimeograph ink:) And yes, there are vintage stains on this page so obviously my mother made this recipe once upon a time. Place chicken, skin side up, in shallow pan. Add butter, lemon juice, salt and paprika (I used smoked paprika). Cover tightly with foil and place in 325 degree oven. Cook about 1.5 hours or until done. Pour off broth and thicken with corn starch. Add 2 tablespoons of sliced almonds, pour over chicken, increase heat and brown. I loved the addition of almonds. Serve with Arkansas rice of course! That does look yummy, and the blue mimeographed cookbook reminds me of 4-H cookbooks I’m sure my mom still has. Great guest quarters, too! It was okay. I only ate three helpings because I’m polite. In fact, I’m so polite I snuck back into the kitchen at night for a late-night snack, AND THEN next day ate most of the tortilla soup made from the leftover chicken. But then, I’m from the Northeast. ps Really, I’m from New England. Northeast includes New York and New Jersey and while fine states, they aren’t me. Actually, I think of myself as from northern New England so as to distance myself from Connecticut, Rhode Island, and Massachusetts. Looks yummy! Trying to find new recipes so going to try this out! I love recipes like this, and it looks so scrummy! Shared on my SM! 2) Stir well and set aside. 3) If using chicken breasts, pound each flat with cleaver to tenderize. 4) Dip each chicken piece the sour cream (or yogurt) mixture, then dredge into stuffing mix. 5) Roll or folder in half each piece of chicken if using boneless breast. 6) Place chicken in a lightly greased 13″ x 9″ glass dish. 7) Pour wine and melted butter over chicken. 8) Baked uncovered at 350 for until chicken is cooked and still moist, max 1 hour. I’m interested in the recipe name. Maybe for a need to feed in short notice? Lol. If anyone knows the origin please respond, and thank you.